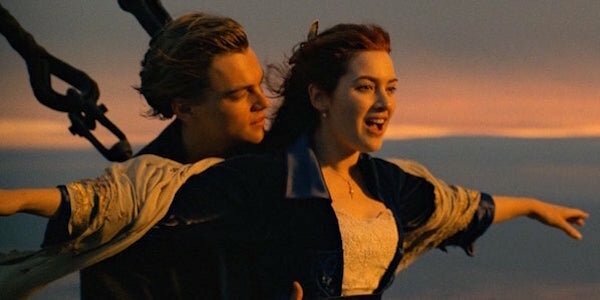 With an over three-hour runtime of the classic James Cameron epic, Titanic, it’s a wonder the dramatic love story isn’t a musical. Seeing Leo DiCaprio and Kate Winslet belt out their love to one another might have just made up for the heartbreaking end that still freezes our hearts. Thanks to the talents of James Corden and Ariana Grande, the 1997 Best Picture winner was shortly brought back with a little song in its step. During a recent episode of The Late Late Show with James Corden, the pair teamed-up for a five-minute tribute to Titanic, using popular tunes to soundtrack the events of the movie from beginning to end. Take a look. This Titanic musical is quite the collaboration that brings some new life into the ’90s film. The video uses a combination of recognizable hits from the likes of Hall & Oates, Lady Gaga, One Direction and NSYNC, making for quite the mashup. James Corden and Ariana Grande performed the “musical” live for The Late Late Show with James Corden audience, an impressive feat for them to compress the events of the movie into short snippets of 13 tracks and within nine sets. As per usual on the set of The Late Late Show, Corden made the performance entertaining and Ariana Grande softly stole the show with her powerful vocals. The soundtrack to Titanic opens with Ariana Grande as Rose singing the Styx song, “Come Sail Away” with James Corden coming in at the chorus dressed as Jack. Then quick transitions from 80s hit “Rich Girl” to Timbaland’s “The Way I Am” add comedy to the segment as Ariana slips out a light laugh and the pair start to dance like it’s 1912 with some Vogue moves thrown in. Then they reenact the iconic pose at the head of the boat while singing to “Learn to Fly” by the Foo Fighters. After Corden and Grande move along with the events in the film by singing pop hits “Just Dance” and “Steal My Girl,” Corden paints Grande like one of the French girls with Ed Sheeran’s hit “Shape of You” on his tongue. The entertaining segment continues with the two talents pointing to cardboard icebergs while exclaiming “Ice Ice Baby.” After yelling “Timber,” James Corden and Ariana Grande pay tribute to one of the most memorable moments in movie history with a bit of Rickrolling with “Never Gonna Give You Up” and then NSYNC’s “Bye Bye Bye” as Jack sinks into the sea. The performance ends on an astonishing note, when Grande flawlessly covers Celine Dion’s “My Heart Will Go On,” with Corden coming in at the end to finish the song off as a duet.